Every year, thousands of games are made for the iPhone. Formula Racing is one of them. I was worried that I was only going to get to review decent-to-enjoyable iPhone games this month. Then I was assigned to review Formula Racing. Crash And Burn: Rotten physics, lousy English translation and poor gameplay mark this game as a stinker. Like a C-List Movie that can only be enjoyed, if barely, for the sake of irony, Formula Racing from Tiny Utopia is a total mess of a racing game. From the poorly translated interface text to the broken game mechanics to the uninspired game design, there is very little positive to say about Formula Racing. But first, the basics: The game uses the iPhone’s accelerometer for a control scheme. By tilting the iPhone, you can guide your little Formula 1 racer around a course. By completing the required number of laps before your opponent’s, you win and unlock the next course. It takes about five minutes to master the controls and it’s a good three minutes of thrills to watch your little racer beat the others. I’ll say this for the game: the colors are great. Red is red, green is green, and there is a soundtrack. So they’ve got that going for them. There isn’t much text in this game, but where there is text, it’s full of quote-worthy idiocy. When you lose a race, you’re told: “Try Again You didn’t place finish.” That ranks up there with “A winner is you!” for poorly translated competitive sayings. When driving around on any given course, the game’s crappy physics will impede you anytime you collide with another car or a wall. Hitting another car will slow you down, but hitting a grassy patch doesn’t impact your speed at all. In fact, the ability to get up to speed is entirely too easy; the game becomes a cake-walk after you get used to tilting the iPhone awkwardly. There are no brakes, which you’d think would make it more of a challenge but really just speaks to lazy developing. If you hit a wall, you’ll occasionally find walls that are passable, meaning they are programming errors that haven’t been corrected. Be careful, because while some will become shortcuts, sometimes exploiting this glitch will lead your car to drive off into a blue abyss. Sometimes the game will fail to record that you finished a lap, and even when you did finish in first, it’ll say you lost. There are no social networking abilities. There are no hidden Easter eggs. There is no replay value other than to show your friends this horrifically broken game. If Franz Kafka ever came back to life and decided to design an iPhone game to highlight the pointlessness of existence, it might look a bit like Formula Racing. After playing Formula Racing, I’m not only questioning what the developers were thinking, but why God would allow something like this to exist. 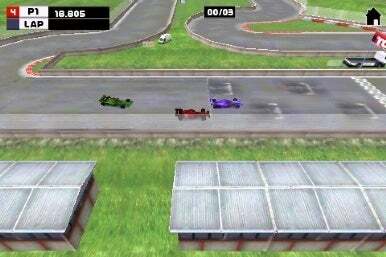 Formula Racing is compatible with any iPhone or iPod touch running the iPhone 2.x software update.